Cute, festive and delicious… these Sprinkle Cookie Bites are the perfect way to kick off the holiday baking season! 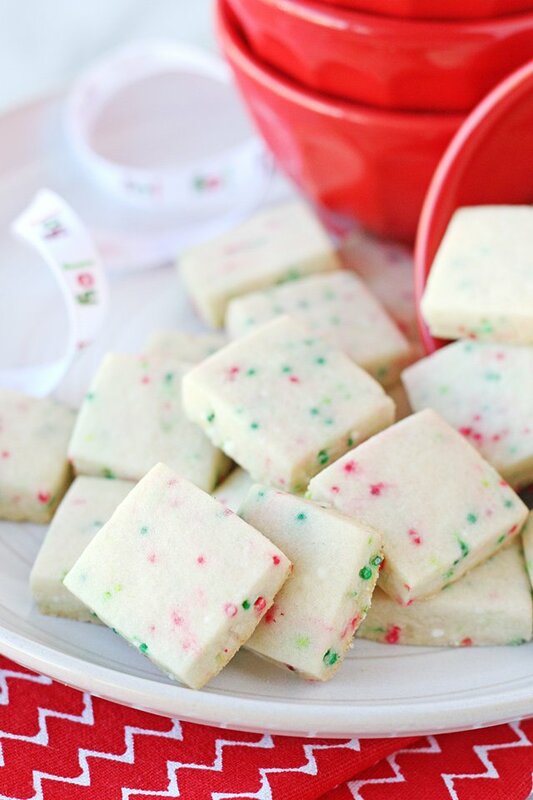 These little treats start with my tried and true Sugar Cookie Recipe and get a festive little upgrade with sprinkles! 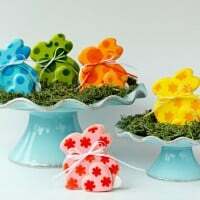 Cut them into little tiny bites and they’re perfect to serve at holiday parties, or pack up in bags or jars as adorable gifts! I’ve made Sprinkle Sugar Cookies before and they’re just such a great way to add a bit of fun to a classic cookie. 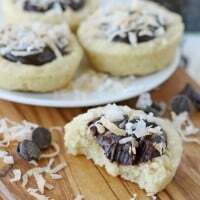 Certainly you could use this recipe to make larger cutout cookies, but this time I cut them into tiny little bites just perfect for snacking. Feel free to use sprinkles of your choice. I used Christmas sprinkles that included red, light green, dark green and white. Keep in mind that the white sprinkles wont show up very much. 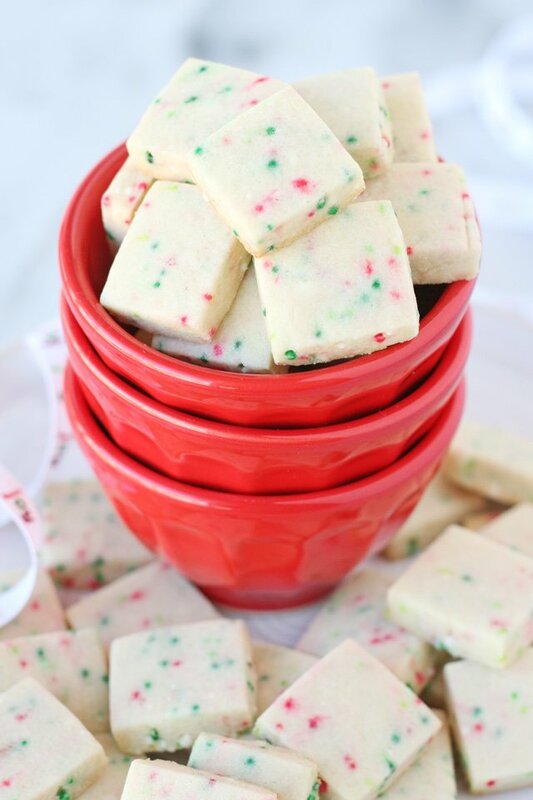 These little sprinkle cookie bites are perfect to package as gifts! Fill a mug or jar with these cuties, add a coffee gift card and you’ve got a little gift perfect for teachers, nurses, friends and neighbors. Just be sure to save a few cookies for yourself! Cute, festive, delicious little cookie bites perfect for any occasion! This classic sugar cookie is similar to shortbread, but sweeter and more tender. 1. In a large bowl add flour, baking powder and sprinkles. Whisk together and set aside. 2. In the bowl of an electric mixer add butter and beat until smooth. Add sugar and blend until fully combined and fluffy. Add egg and vanilla and blend. 3. While mixing, slowly pour in the bowl of flour. Mix until dough forms and starts pulling away from the sides of the bowl. 4. Scoop dough out onto a work surface and form into two large balls. Spread out a piece of plastic wrap on your work surface and set one ball of dough in the center. Lay a second piece of plastic wrap on top and roll the dough to about 1/3" thick. Carefully pick up the slab of dough, still enclosed in the plastic wrap, and place slab on a large baking sheet. Freeze slab of dough for about 15 minutes, or until firm. 5. Use a knife or bench scraper to cut the dough into small squares. Mine were about 3/4" x 3/4". 6. Preheat oven to 350*F. and arrange cookies about 1" apart on a baking sheet lined with parchment paper or a Silpat type liner. 7. Bake cookies for 8-10 minutes. 8. Cool cookies on the baking sheet for 1-2 minutes, then move to a cooling rack. Once fully cool, store cookies in a sealed container until ready to decorate. Cookies remain fresh (when stored well) for at least a week. Feel free to use sprinkles of your choice. Avoid re-rolling the dough too many times, as the heat from your hands and moisture in the dough will cause the colors in the sprinkles to bleed. As detailed in the recipe above, chilling the dough until firm makes cutting and handling the cookie dough so easy! Once chilled, I used a long knife to cut the dough. I just eyeballed the sizing, but feel free to use a ruler if you’d like to be more precise. So buttery and colorful! I love it! 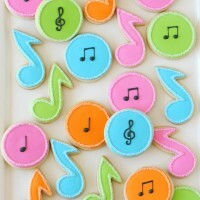 ooh, these are so cute! I wonder if a pizza cutter and a ruler would work well… hmmm I may have to experiment and with different extracts, these would be SOOO fun. Cute as a button! And they look and sound delicious to boot! only you could make squares look SO cute! These look great! Very festive. Thank you so much. You’ve totally captured the holiday spirit with these cookies and I wish I had a dozen in front of me right now! These are going to be perfect to make with my little cousins this weekend. Simple cookies + whimsical sprinkles = festive perfection! 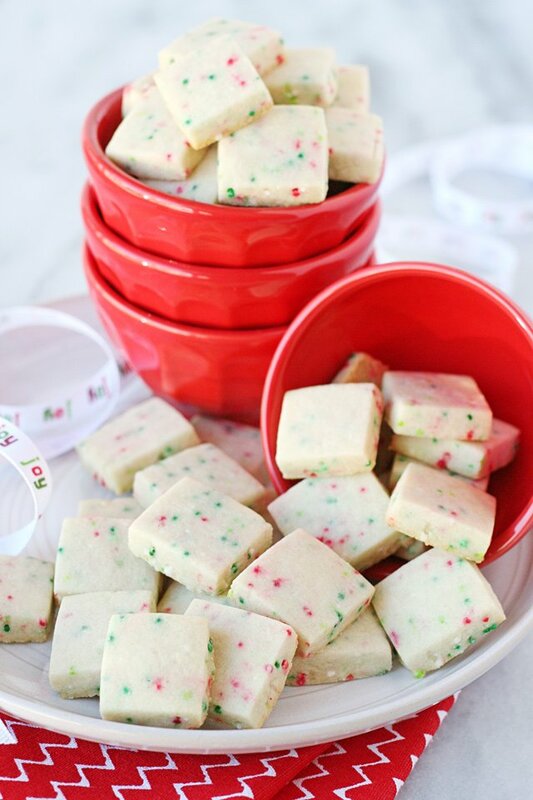 Thinking about subbing crushed peppermint for the sprinkles. 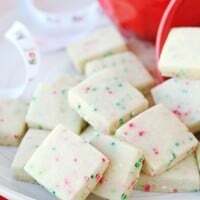 My neighbor gave me shortbread cookies with peppermint one year for Xmas and I have never been able to find s similar recipe. This might work ! Sprinkles make EVERYTHING better. Love these! So cute and festive! I love that they are bite-sized. 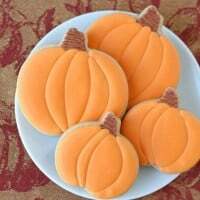 These cookies are so festive! I love them for the holidays. These look and sound so good that they will be on our table of goodies come Christmas Day. Thanks so much for sharing them with us. These look so adorable. 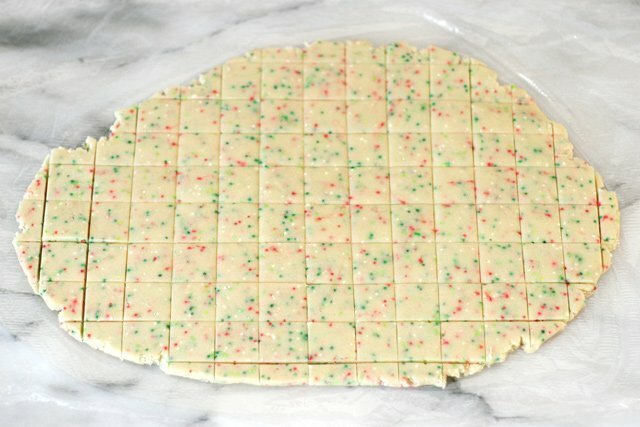 I am planning to make these ahead and wondering if it’s okay to freeze the dough after mixing the sprinkles? What type of sugar do you use? Castor sugar? White Sugar? In the U.S. any recipe that lists “sugar” is referring to white granulated sugar. Hope this helps.